Amy: As a former cast member, I am going to refrain from choosing one person, but send a big thank you to all of the Walt Disney World Cast. Every day, many thousands of people go to work while the guests play. It's generally a wonderful place to work but it is still work. I think the cast is the true magic of Disney. I've been to other parks and other vacation destinations but no other place has their people so personally invested in the experience of the visitors. Be sure to be generous with the thanks on your next visit. “Everybody knows Wanda. She’s the cheery spirit of Olivia’s….” And that was the absolute truth. 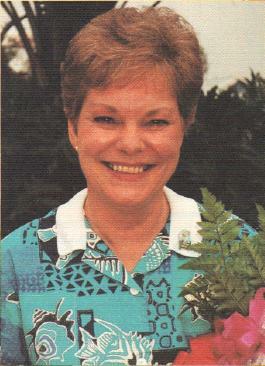 We met Wanda when we first toured The Vacation Club and had lunch at Olivia’s and saw her on many successive trips to WDW. Not only did we remember her, but she remembered us. She was lots of fun, once she even followed us out of Olivia’s just to tell us a joke. Her story continued: “Wanda is a backbone asset to the fun, friendly feeling that is Olivia’s.” I don’t know what happened to Wanda, but we still miss her when we eat at Olivia’s. Unfortunately, I don’t know the name of the second cast member. He was working at EPCOT when my wife met him near park closing time outside of MouseWorks. Besides working at EPCOT he also worked at the front desk at Disney’s Old Key West Resort where we were staying. My wife likes to talk to the young people who work at WDW ever since our daughter worked in the Magic Kingdom in Disney’s College Program. In talking to this young man, my wife, who always rides one of the Electric Convenience Vehicles (ECV), was explaining she was waiting for her husband (me) who was in MouseWorks shopping. She explained to him that she did not like to ride the ECV in any of the stores as she did not want to bump into anyone or anything in the store. They talked for quite a while as I was shopping. He thanked her for her thoughtfulness in not taking the ECV into the store, especially at park closing. When he found out we were staying at OKW he said he would do something special for us. We didn’t actually expect anything, but the next day he had a floral arrangement sent to our room. We enjoyed the flowers through out our trip and still have the vase as a reminder of our nameless cast member who had that extra Pixie Dust. Ridge: Most cast members want to make a difference in your vacation experience. I have had several times were cast members were just doing their jobs, no more, no less, and I can't hold that aginst them. However, the memorable times have been with the cast members who are really looking to spread a little extra magic. There was my outstanding Jungle Cruise Captain Chad (which I have video of that I hope to post one day) and there have been outstanding bus drivers. One of the most intesting coversations I have had with a cast member has to have been with "Mark". I say Mark with quotations because ashamedly I forgot his name. On the same day that I took the picture of Amy having some ice cream and missing Baloo and king Louie, we meet Mark. He was a manager in park security, he introduced himself and asked if we were enjoying our stay, if there was anything special that brought us down. He laughed when we told him we had annual passes and a four day weekend, what else would we do? Seeing how he was a manager of security and I have a degree in criminal justice I asked him questions about security, how to get in, hours worked, how they work with the local police and numerous other boring questions to most other people. He was excited to get to tell someone about his job and was really glad that I was eager to know about how I could one day do something similar. I really thought highly of his willingness to share information, and I was really excited to hear it. Having someone on the inside give real non-sugarcoated information about the happiest place on Earth makes you remember how many people are never seen, but are working to make your stay enjoyable. Let's make this a celebration of great Cast Members! Please share your experiences in the comments below. Great minds think alike. Bruce of Unknown Magic Within Walt Disney World recently did an interesting post on Cast Members. My children have often been the recipient of cast member kindness. When my son was much younger, he started collecting pins but lost his favorite (Pirate Mickey) in the park. He saw one just like it on the lanyard of a lady working the register at the Pirates of the Caribbean store. He stared at it for a moment, then said to me: "Dad, that looks like the pin I lost". The lady paused, smiled, and gave it to him: "I wondered who lost this pin", she said. To this day, he believes she really did find his pin. That's magic! there are so many stories of cast member kindness, it's hard to narrow down the 'best' act of kindness/magic. on my last trip, my group was in epcot, enjoying the evening and sipping on way-too-powerful-for-a-theme-park margaritas. being silly and overpowered by the disney spirt, we began dancing to the world showcase music. a cast member came up and presented our group with a 'best dancing group' certificate. that moment was one of the highlights of our trip! ... and I have been posting here for a little bit and JUST figured out that you can link your twitter account as your name... silly me! Great Post Team! My favorite is Andy over at the Boardwalk, Great guy and filled with the Magic! In 2008, I was in WDW with my family (6 adults and 4 kids, ages 3.5, 2, 1.5 and 10 months). Being the daughter of a Marine who then became a State Trooper, I am the mom who knows every morning exactly what clothes my kids are wearing and keep a close eye on them at all times . . . of course. Well, while waiting for my husband, father and brother to ride Splash Mountain, I realized my 3 year old was nowhere to be seen. Of all places to be missing a child, we were right between Splash Mountain and Big Thunder Mountain. I didn't panic at first because he is pretty shy and normally does not stray more than a few feet from me. My sister in law and mom took the three other kids and spread out while I looked for Joey. The first cast member I saw was Craig at Splash Mountain. He immediately went into action and involved other cast members to look for him and luckily I was able to give a very specific description of what Joey was wearing. Low and behold, he was in line with my dad, husband and brother to ride Splash Mountain. I have never felt so relieved in all my life, but Craig was instrumental in keeping me calm and helping find Joey. Let's just say the other male members of my family received quite a tongue lashing for taking Joey with them after he told me he did not want to ride SM. I must admit I have never been so scared in all my life, and at the same time never so thankful to Craig for helping me. Thank you all for sharing your stories! This is exactly the Cast Member magic that keeps us all going back to WDW.